Like any kid growing up in the late 70’s, I LOVED Star Wars! So when the Christmas season approached, I had a few tinsey winsey requests for Santa. Christmastime in the late 70s was pure magic! That magic, of course, was brought to us by that oh-so-glorious Star Wars merchandise! Here’s my run-down of Star Wars gift ideas all available (perhaps not easily) during the end of our favourite decade, just in time for the holidays. This was the wonderfully adapted children’s book of the film published by Random House. It was loaded with photos, perfect reference material for those drawings of Han Solo, and Chewbacca you were saving your crayons for! They crammed the story into a brief but descriptive short amount of pages, which young readers pored over. Not much to say about these guys, other than the fact that they were THE Christmas toy to have that year…or any year after their initial release in early 1978. The first 12 figures were on every Christmas list everywhere! The lineup: Luke Skywalker, Darth Vader, Princess Leia, Han Solo, Chewbacca, Obi-Wan (Ben) Kenobi, Stormtrooper, Death Squad Commander, Sand People, and Jawa, and of course See-Threepio, and the lovable Artoo Detoo. Yep, puzzles were still a GREAT gift back then. You had your choice of dozens of amazing Star Wars images. Heck, when you were done assembling you could even glue it to a piece of wood and hang it in your room like a poster! It’s been done folks, so don’t give me that look. Quick, guess what you have to do in the game? Be the first player to DESTROY THE DEATH STAR! The game consisted of a game board with the (you guessed it) Death Star in the middle. Your tiny squadron of X-wings must orbit the Space Station while looking for the chance to land on the exhaust port square. All the while you evade TIE Fighters, you even have to avoid Darth Vader himself. As an 8-year-old kid, this game provided hours of fun. Ah, times were slower than they are now. A good board game always hit the spot, especially around the holidays. Oh yes! Luke’s classic hot rod speeder on Tatooine! If you couldn’t talk your Mom or Dad into a Death Star playset, this was your next best shot at being the talk of the playground. The action figure scaled masterpiece really looked like it was floating as you push it across the linoleum of the kitchen floor. As a kid, I was hungry to learn more about Star Wars! How did they make it? Who were the folks behind the special effects? Who were the people who played the characters? What were Stormtroopers? Was Ben Kenobi really Luke’s dad? I’m kidding! All of these questions were answered monthly via this awesome magazine/poster book. No surprise according to the description, the pages of the magazine folded out into a huge poster! A great present to see under the tree! Topps trading cards of every flavour were already known to most kids by the time Star Wars hit theatres. So it was no surprise the movie would be adapted into trading card format. What made these things so attractive was the small price and nice payoff. Trading cards, a sticker, and a stick of bubble gum? SOLD! When I was a kid, I loved building models! Both Artoo and Threepio by MPC were perfect subjects to build as you pretended you were a technician in some droid building factory on a distant planet somewhere. Was it just me? Too much model glue I guess. Both colour moulded models were much more detailed than their regular toy counterparts, which made them perfect for display or even some gentle play. The smell of walking into a t-shirt shop back in the late 70s was like no other. Picking out the perfect Star Wars iron-on transfer, picking your favourite colour t-shirt, and 15 minutes later you had the only thing you’d wear until it literally fell off your body. The whole experience was one of the best you could have during childhood. Kenner’s scaled down starship was the perfect toy to pass those snow days from school with. Detailing on this toy was absolutely amazing! A turntable radar dish and laser turret, and retractable landing gear made the Millennium Falcon an absolute must! This baby could reach point five past light speed while chasing the family dog. 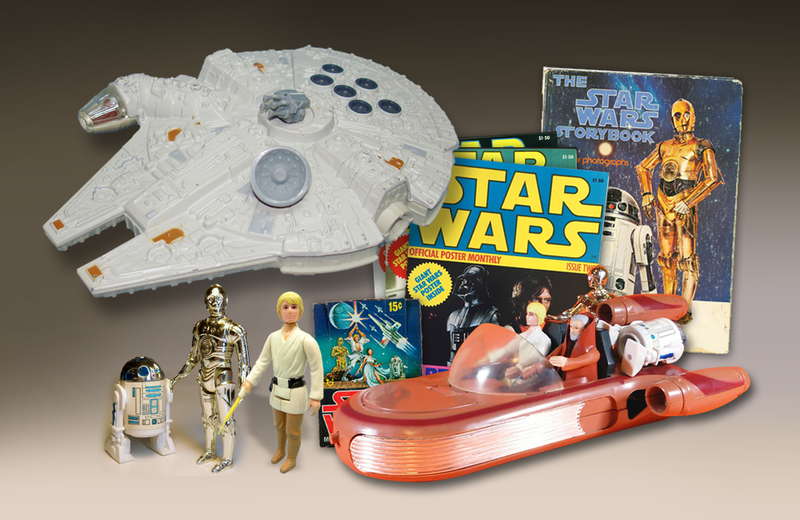 So there it is, a list of Star Wars goodies any kid growing up in the late 70s would be happy to unwrap! It sure beats sweaters and socks. You’ve still got time to relive a Star Wars childhood Christmas! Quick, to eBay! Tom Berges is the founder and curator of I Grew Up Star Wars. In 1962, Milton Bradley released Lolli Plop, a brainteaser in lollipop form.